Knowledge) and Current Affairs.Current affairs updates till 2 August are given. 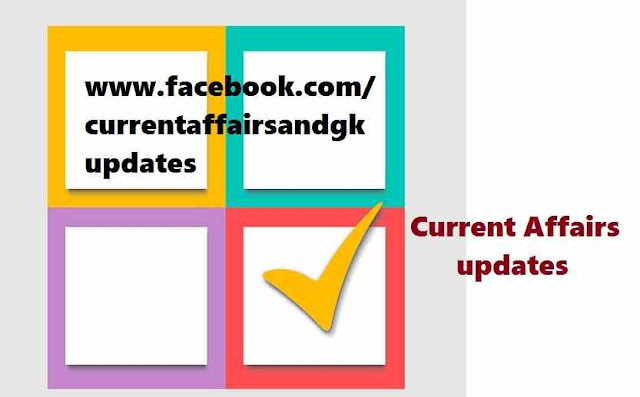 Updates on 31 July, 1 August and 2 August are covered.These updates are very useful for various competitive and recruitment examinations like SSC(Staff Selection Commission), RRB (Railway Recruitment Board),SBI Recruitment,IBPS,Postal, Insurance and other state level Recruitment tests. 1.Ravichandran Ashwin(Cricket),Indian Off spinner was presented with Arjuna Award which was conferred on him last year. 2.Professor Rajendra Srivastava has been named the new dean of ISB (Indian School of Business) (As announced by Ai Godrej, Chairman of the ISB group). 3.Rajath Chowhan created history by winning a Silver medal in the world Archery Championships in Copenhagen.This is India's first individual medal in the world event. 4.Facebook to launch Internet dropping Drone and Google to launch Loon Project to reach the people of various areas where internet is not available. 5.Nicole Barr,a 12 Year old UK girl gets highest Mensa IQ test score 162(Means she is more intelligent than physicist Hawking, Microsoft Founder Bill gates and Einstein). 6.Indo-Israeli Barack-8 Missile to be test fired in August 2015. This missile can act as a potent shield against incoming missile, aircraft and drones. solar flow battery is 20% more efficient than Lithium-Iodine Battery.